Wie gut haben Sie die Kolumne von Elisabeth Ribbans verstanden? Testen Sie Ihr Leseverständnis mit dieser Übung. Read the column by Elisabeth Ribbans and then do the exercises below. Ah, the joys of wordplay. But these days, the dog with no nose is suddenly everywhere and it is no laughing matter. I don’t mean literally no nose, of course; I mean noses so squashed that they are almost more ornamental than functional. I’m talking about pugs and French bulldogs and other “brachycephalic” (or flat-faced) pets, the majority of which have such inadequate noses that they cannot breathe properly. Those snuffling sounds are not sweet, they are not even normal — they’re a cry for help. Compare the skulls of bulldogs over the past 50 to 100 years and you will see how selective breeding has pushed their noses back into their heads. The price of a “cute” or “comic” face is not only respiratory difficulties but a high risk of heart, eye, teeth and skin problems. Yet, presumably unaware of the potential suffering, people are buying “brachys” in ever-greater numbers. Driven by celebrity ownership, the number of French bulldogs has increased by 3,000 per cent in the UK in the past decade, replacing Labradors as the most popular breed. Pugs are number three. The market has helped fuel the trend by using images of flat doggy faces to sell everything from T-shirts to table mats, banking services to baked beans. Now, vets and animal welfare organizations are pushing back. As part of its #breedtobreathe campaign, the British Veterinary Association is asking companies to stop using flat-faced dogs in their advertising and marketing. Similar campaigns have been launched in Ireland and Germany. The fashion for flat-faced breeds has seemed unstoppable, but there are signs that the message is starting to bite, with Heinz, M&S and Halifax bank among the companies that have agreed to reconsider their use. At the start of this year, Moonpig, which claims around 70 per cent of the UK market for online greeting cards, was offering 36 cards showing pugs and 29 with bulldogs, compared to 13 with Labradors and just two with spaniels. 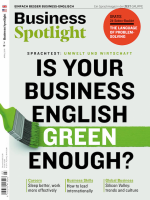 So, I got in touch to ask if they thought this was OK.
Dieser Beitrag stammt aus dem Magazin Business Spotlight 3/2019. Die gesamte Ausgabe können Sie in unserem Shop kaufen. Natürlich gibt es das Magazin auch bequem und günstig im Abo. Wie gut haben Sie die Kolumne „Beware of the charming, self-confident manager!“ von Adrian Furnham verstanden? Testen Sie Ihr Leseverständnis mit dieser Übung. Wie gut haben Sie die Kolumne „Gender stereotypes exist — like it or not” von Adrian Furnham verstanden? Testen Sie Ihr Leseverständnis mit dieser Übung.